Grant: Co-op’s difficult because you need to both design player interactions and the scenario. Typically you just design actions that all players do against each other. Now, I need to design the game played by the “AI” and the game played by players. But I don’t want to make the mistake (as far as I see it) of many co-op games which is compensate for lack of HUMAN choice by having a ton of cards. me: and making that “system” with less-randomness turns the game into a puzzle which is solvable. me: Roll a fat stack of dice. Players each draft a dice for their action. That is officially when this game… which I finally prototyped nine months later… was actually born. Well… that’s when the foundation was laid. It wasn’t even for me. I was offering it as a solution to a friend. During that conversation (which is much larger than this excerpt) Grant and I discussed all the problems we have with most co-op games and it all boils down to randomness. Artificially replicating meaningful decision is difficult (if not impossible with a board game) and to compensate, most games incorporate massive luck elements like huge decks of cards or piles and piles of chits and dice. My solution was to use a relatively small pool of outcomes, but let the players decide how the game would challenge them through the draft. I threw out the dice element and made it a deck of cards. Each card has two halves: the player benefit and the game effect. We deal out cards (currently two more than the number of players) then we each draft one which gives us some sort of benefit. After the draft, there will be two cards left over. We now have to deal with those two cards. Grant liked the idea, but it didn’t fit his game and he ultimately stopped working on his co-op. I added the idea to my ever growing list of mechanic ideas. You keep one of those, right? Seriously. You should. Authors keep little notes about character, plot, and setting ideass. I keep little notes about mechanics and components. Maybe one day I’ll use them, maybe I won’t. If I need inspiration, I can always open up my notes and read through past ideas. If you don’t have a list of things, start one today. Try to come up with three mechanics that you’d like to include in a game some day and write them down somewhere. Then, build on that list as you have new ideas. You’ll thank me some day. 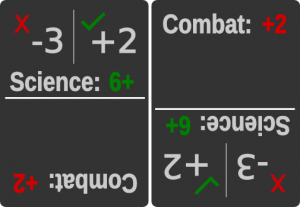 Cards can be dual purpose or the game can benefit from the same mechanics as the players. Players may be compelled to take bad cards just to prevent the game from playing an extremely powerful card. Could be a co-op/competitive co-op type engine. This idea sat in my idea bin for months. It stewed around in my head and it was difficult to ignore it… the problem is, the idea was really flat. How do I turn the card you draft into something that helps you with the cards that weren’t drafted? A few months later, motivation came in the form of Protospiel Milwaukee. As the convention neared, I wanted to have something to work on. Most of my prototypes were well-baked at that point and I had nothing current to develop… so I started trying to force myself into thinking about this one… and I made some progress. What if we were all investigators with various skills. Each player had a few unique stats and the cards drafted would help you boost those stats. The cards that were left over would be challenges that we would have to face either individually, or as a group, using our stats. I liked the idea of semi-cooperative from the beginning… so it fit. Sadly, that was as far as I got with the theme and it really held back development. I decided that we’d be investigating Cthulhuian horrors and failure would result in a loss of sanity. If you went insane, you were out. But I don’t want to do Cthulhu. I don’t avoid Cthulhu because the genre is overdone… I avoid it because I love it. I don’t want to mess with it. I don’t want to try and design a game that lives up to the standard of Lovecraft’s work. Okay… that’s a huge load of crud. The reality is, the theme didn’t help me drive the game forward. I had a quirky little mechanic that I wanted to use (and was driving me bonkers) and no actual theme to build on. Slapping Cthulhu on the side didn’t help me work out how or why I should proceed forward with it. Still… I tried to work on it at Protospiel. I discussed it with friends and fellow designers. 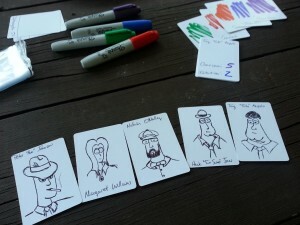 I even started drafting up card ideas at the bar… but nothing ever came of it. Until now. My family takes a week-long camping trip every July. This year, I had nothing to keep me occupied during the day, so I took along my idea box, hoping that I’d come up with something during the week. My idea box is nothing more than a simple cardboard box with some tokens, dice, blank cards, and some sharpies in it. It’s perfect for busting out rapid prototypes while they are fresh in my mind. This one wasn’t exactly fresh, but it needed to be done. The more I tried to be creative, the less inspired I became. Miraculously, I had an epiphany that drove development forward. I needed a second deck of cards. One that would provide short-term benefits. You can use these cards to gain temporary stat bonuses, draw more cards, or maybe even mess with your opponents. I decided to leave the theme alone, but set in 30’s noir instead of a Lovecraft story. The players are all investigators working on the same crime. It is still a semi-cooperative game in the sense that some cards will require the entire group to succeed or fail together, but most cards are faced individually. If a player is eliminated, the pool of helpful cards dwindles, making it harder to proceed. Computer simulation of my terrible hand written cards. So, here’s the choices. You can draft this card, and it will give you a boost to your Combat stat. This is a permanent gain. Place the card next to your character. If it remains un-drafted, then all players have to face the Science check. If you pass the check, you gain two points. If you fail the check, you lose three points. It’s pretty straight forward… which is how I tend to make games. After I got rolling on the idea, it became very simple to build out the deck. I even drew up some characters for flavor. I put quite a bit of effort into it during vacation. The problem is, none of that effort was particularly inspired. The game came together (I think, I haven’t played it) but I had to force it out. My main problem: the theme doesn’t assist the mechanics in any way and that’s extremely foreign to me. I wouldn’t say that I design for the theme all the time, but I often develop mechanics specifically because of the theme. This game has none of that. In the previous card example, what happened in the story of the game. We, as a group of investigators, were working a lead when…. what exactly? We get attacked by a band of thugs and we each have to take on a combatant? Why are we sometimes taking on investigative tasks alone, but other times working as a team? Are we pretending to solve the case “together” but secretly trying to get into the papers more than everyone else so we can get promoted? Why the heck would there be a five-man investigative team anyways? Are we all private investigators that end up in sticky situations together from time to time as the investigation unfolds? What are we investigating anyways? Well, regardless, the prototype is done… for now. I’m not writing rules. I’m not naming cards. I’m just going to run some free-form tests at GenCon and see where it takes us. I have a nice pile of extra blank cards so I can adjust the game as we go… who knows, maybe something new and fresh will come out the other end of the show. Whatever happens, though, I hope to find a way to make it click in my head. I thought making the prototype would help me forget about it… obviously, I was wrong.